Only last week, my inspirational father highlighted me in one of his amusing blog posts. He then proceeded to include me and the inspirational words of the current Education Secretary Damian Hinds, in the same post. Of course, it was really great to be included and held in the same high regard as the education secretary, with yet more visionary thinking and the current drive to get our children out of the classroom and into the Great Outdoors. So much so much, Mr Hinds is now actively encouraging children to down tools in the classroom and effectively go and climb trees! Not surprisingly, when I read his recent words. I not only fell off my chair in surprise but also nearly choked on an enormously large raisin, found in my healthy organic morning porridge. After an initial few moments of sheer delight I soon came back down to earth with a bump and the feeling of ‘I’ve heard it all before’, was soon at the forefront of my mind. Nevertheless, it was certainly a surprise and a welcome break from the usual daily dose of all things Brexit. It was encouraging to hear such refreshing news and something that did actually leave me feeling rather euphoric, if only for about 5 minutes. Sadly, in today’s world, we live with constant promises only in the next breath to be let down by the same people who, in fact, cannot keep the promises they made. As a result, even the most optimistic can indeed develop a growing level of scepticism towards this kind of statement. It seems optimistic to continually follow on from other stories like ‘kids are glued to the iPad’ or ‘obesity in children is a BIGGER problem than we first thought’. Well, of course, it is and if you continue to confine children and education to the classroom, bore them with mechanised teaching, don’t ease back on statistics overload and continue to label them from such a young age, the problems will inevitably become far too predictable and in turn solutions become harder to find. As a result, I couldn’t help but wonder just how long it has taken Mr Hinds and the rest of the experts found in Parliament to dream up this new and wonderfully unique idea? It is an idea that has been bandied around for years and years and one that I have been actively encouraged to personally do, after guidance and support from my parents, since I was born. So, Hello… Mr Education Secretary… the monitoring god and expert of all things taking place in our wonderful schools. As a humble individual, a so-called teacher, who feels he has little impact and voice in a world and profession dominated by egotistical big heads who only seem to be valued for having a big mouth. Well, as an educational practitioner, I have actually been doing what you are suggesting for many years, prior to your recent words. In turn, I have continually pursued this side of learning off my own own back created a vision, challenged the doubters and projected that successful vision through inspiring youngsters and fellow colleagues to realise that learning from the outdoors is actually a cause worth fighting for and something that should be valued and implemented more than it actually is. Yet, in a world of too many schools not following and buying into the same vision, the voice of inspiration is still really measured by those who value results, league tables and advances in technology, over a more creative and free-thinking approach to our education and current practice. For me, it seems to be a big contradiction, as it seems the only way we can really measure success is from results and it is those results that are generally measured by children sitting down at desks. Together with classroom-based activities and teaching strategies that seems to support this approach. The fact that the iPad and computer use is far too prevalent among young children and that children are too sedentary and overweight seems to go hand in hand with what education is really encouraging. So much so, this seems to naturally fit into the constant cycle whereby we as humans, teachers and parents seem to keep revisiting the same issues, so apparent in our society today and if this is true, then the problem is a lot bigger than you think and not just down to the size of our waistline! Of course, I do get it, I’m clearly not that stupid and haven’t been in the profession for nearly 20 years, obtained relevant qualifications and then worked my way up the ladder for nothing, but I feel if educators were to be a little more creative in their thoughts, maybe the ideas present by Mr Hinds, in November 2018 would have been actively encouraged and supported when I first started doing this kind of thing, back in 2002. With that said, it doesn’t really make to much sense and still remains something sadly missing from our overall society and cultural outlook. As a trained outdoor practitioner, I feel there is no point looking towards the Scandinavian pioneers for inspiration and advice if our present society doesn’t really fully value or reflect the same approach. I know this because after recently visiting the Scandinavian countries of Denmark, Norway and Sweden. I was impressed by their love of the outdoors that is ingrained in their culture, for generation upon generation. The experience left me feeling inspired, but with a feeling that we are still light years behind. Not wishing to turn this post into a rant or where my opinion is perhaps more valid than yours, the reader, I continually put my thoughts forward in my blog ‘Thoughts and Stories from the Great Outdoors’ and everything that encompasses and encourages others to simply get outside and utilise it, but I do feel I cannot just sit back without offering a thought or opinion when it concerns something I’m passionate about. As a result, I never want to ruffle the expert's feathers or indeed turn this blog into a forum that focuses too much on moaning and groaning. Most of my expressive language is tactically cultivated out on my bike to and from work or on a regular run, where I have wildfowl to talk to. With regards to the statement highlighted by Mr Hinds, I will actively encourage him to consider my thoughts within a letter I will compile and write to him. 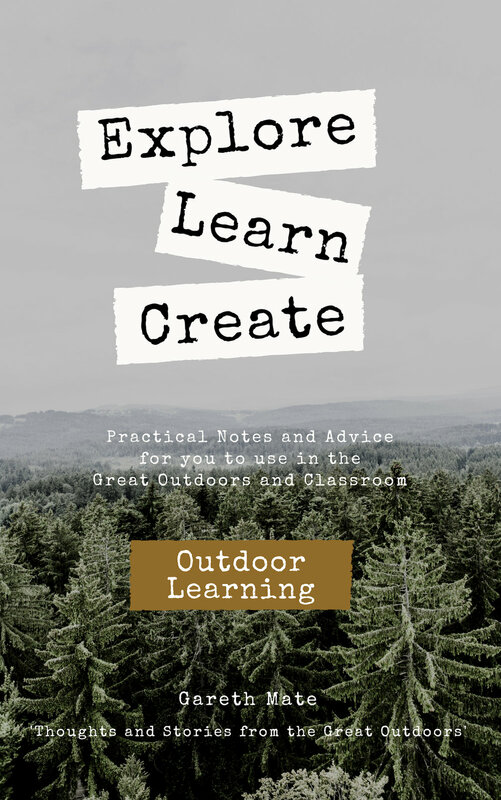 In turn, I will not only encourage him to buy my book about outdoor learning, subscribe to my blog, but also ask him to resonate with a humble, experienced teacher who is simply trying to fulfill the role I signed up to do. To actively encourage, inspire, question and hopefully influence youngster to be the best they can be. Develop a vision, purpose and life for themselves, which not only offers them challenge and fulfillment but also leads them to achieve all they can in this life. Hopefully, Mr Hinds will consider my thoughts and take me up on my offer of an Organic Coffee in a natural setting of choice. We can then muse on our thoughts together, compare the size of our homegrown marrows and indeed consider how we can work together in order to revolutionise our education, helping our children to be children, once more, and allow them to enjoy a childhood filled with adventure and interest, fresh air, freedom and, in turn, help to bring the old Education Policy of Excellence and Enjoyment (Yawn!) back into the forefront of our minds once again. After all, learning is supposed to be fun… right!